December 14, 2008: Interview and live performance at the famous Dutch vrijegeluiden TV (music channel). The following clicp is an extract (4 min.) from a documentary by CBC TV (BravoCanada) broadcasted on January 12, 2008, 8:30pm. 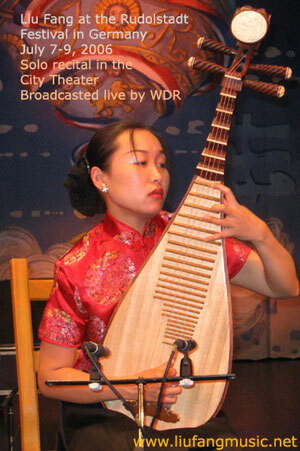 Liu Fang's solo concert at TFF Rudolstadt festival on July 9, 2006, recorded live and broadcasted on ARD TV in Germany. 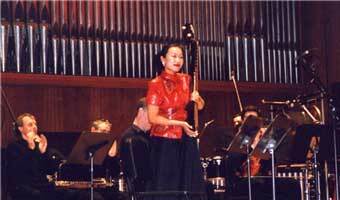 December 16, 2008: Concert with Liu Fang and friends - the 1st concert in the series with CONTRASTS IN CHINA. Liu Fang on Pipa (Chinese lute) and guzheng (Chinese zither), Yoshio Kurahashi on shakuhachi (Japanese bamboo flute), Pops Mohamed on African kora, kalimba, mouthbow and Ziya Tabassian on percussion Intrum grafting (Tombak, framed drum). live recording, and broadcasted on March 27, 2009, by the Dutch music radio - Concertzender Live. Click here for information and play list. On March 22, 2007, concert in the KIT Tropentheater with Liu Fang (Pipa, guzheng) and Yoshio Kurahashi (Shakuhachi). Concert live recording and broadcasted by the Dutch music radio - Concertzender Live. December 18, 2008: solo recital, Abu Dhabi, United Arab Emirates. December 16, 2008: Liu Fang and friends: Musiekgebouw, Amsterdam, the Netherlands. December 12, 2008: solo recital, Helmod, The Netherlands. November 28, 2008: Solo recital, Festival Málaga Ritual, Málaga, Spain. Nov. 20, 2008: solo recital, Thalia (Symphony Space), NYC, New York, presented by the World Music Institute. 30 October 2008: Liu Fang perform at the showcase of WOMEX (World Music Expo) in Seville, Spain. June 15, 2008, 3pm: Solo recital, Groningen museum, the Netherlands. May 2, 2008: solo concert at the Bray Jazz Festival, Ireland. April 26, 2008, 21:00h: solo recital, Centro Cultural La Cam, Alicante, Spain. April 5, 2008: solo recital, Salle Pierre-Mercure(Centre Pierre Peladeau, Montreal, QC, Canada), presented by PRODUCTIONS TRAQUEN'ART INC. - Série Musiques et Traditions du Monde. October 13, 2007: solo recital at the Quai Branly Museum, Paris. Feb 9, 2007: Solo concert, London, Stage at The Pizza On The Park, 11-13 Knightsbridge, in association with fRoots magazine, recorded live by BBC Radio 3's "World Routes" programme. Feb 8, 2007: Tan Dun's "Ghost Opera" for Pipa and string quartet. deSingel Antwerp, Blue Hall, Belgium. Oct. 16, 2006: solo concert, Solo recital, Salle Philharmonique de Liège, Belgium. Oct. 2006: solo tour in the Netherlands. August 4, 2006: Festival Les Escales de Saint Nazaire. Liu Fang received the prestigious French Academie Charles Cros Award. August 1, 2006: concert at Lewes Guitar Festival, England. July 9, 3:30pm: Solo concert at the City Church, recorded by Bavarian Radio and TV. May 8, 2006: Liu Fang solo recital at the Theatre de la Vill in Paris. November 16, 2005: Liu Fang participated the concert "Melody dialogue among civilizations" dedicated to the 60 anniversary of UNESCO, Congress Hall of UNESCO, Paris. October 2, 2005: Radio-Concert au baut du Monde, Montreal. May 2005: pipa solo concert at the Bath International Music Festival, UK. March 2005: Solo concert tour in Holland. February 2005: Concert tour, Jeunesses Musicales Canada. Januery 13, 2005: pipa and string quartet (Belgium national radio). July 28, 2004: Liu Fang solo recital at 30th Summer Film School 2004, REDUTA Hall, Masarykovo namesti, Uherske Hradiste, Checz Republic. 20.05.2004: Concert with Malcolm Goldstein - duet pipa and violin for improvized music - at the Musée d'Art Moderne et Contemporain, Strasbourg, France, a great success (see pressreview). March 27, 2002: Solo recital - Chinese traditional and classical music, Pierre-Mercure hall, The Society of Centre Pierre-Peladeau, Montreal (Quebec) Canada. (Supported by the Canada Council for the Arts). September 22, 2001: 7th CHIME conference, Venice, Italy, Liu Fang performed Zheng for two world premieres: "Stockhausen in Gallipoli" composed by Giovanni Mancuso for Quartet d'archi, Clarinet, Zheng, percussion, orchestrina da la tavola. "Five Chinese poems" composed by Janet Maguire for Bass, percussion, clarinett, guzheng, and cello. 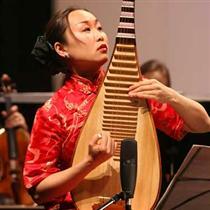 She also performed pipa for Zhou Long's composition "Soul" for pipa and string quartet. 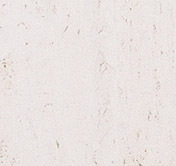 February 7-17, 2000: Concert Tour with the Nishikawa Ensemble from japan. Montreal - Ottawa- Quebec Citiy - Toronto, premiered compositions by Diego Luzuriaga, David Loab, and Yoshiharu Takahash. 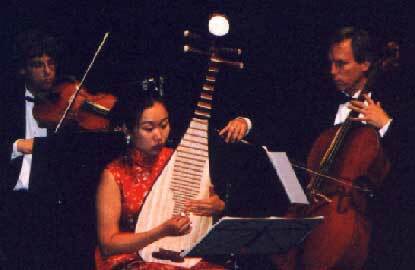 November 21, 1999: Trio with George Gao (erhu virtuoso) and Anna Guo (Yang qin), Sala de Conciertos, Biblioteca Luis Angel Ararango, Santaf?de Bogota D. C., Columbia. September 17, 1999: Two pipa concertos with Moravic Symphony Orchestra at the 5th CHIME conference, Prague, Czeck: "Ghost Opera" composed by Tan Dun and "The King Chu Doffs his Armour" composed by Zhou Long (Conductor: Wang Jin).